— All of our momentary sufferings for Christ are insignificant compared to the eternal weight of glory that they prepare us for. But what is that Glory really about. And is it worth it? Living life in Jesus Christ is heavy in every sense of the word. We make many sacrifices for God. Think about how many hours you have spent in church in your life. If you have been worshipping regularly, you have put in a lot of time! Think about all the times when you have tried to live the way God commands, and you have lost something because of it. Perhaps you lost a promotion or a friend? If you live you live your life for others as God commands, people are going to take advantage from time to time. You will miss out on accumulating wealth and happiness if you live for others instead of only for yourself and your own people. If you attempt to teach people about Jesus, you are going to experience rejection. Some people might think you are some kind of Jesus freak or a downer, and they may cut off relationship with you. This loss of relationships, happiness, money, time, and energy can produce suffering in us. This suffering accumulates, and it can feel like we are carrying a heavy burden. Even though it is mental strain and pain, it can feel like we are holding the weight of the world when we try to live for Jesus today. And it just is not fair! If we live a good life according to Jesus, we should get rewards. Right? God asks a lot of us. When we suffer for doing what is right, it is an injustice! And most of the time, when we express feelings like this to our pastor or our Sunday school teacher, or our church elders, what kind of response do they give you? I’m not sure about your individual experience, but many people have told me that it will all be worth it when we die, and we get to spend eternity is Heaven! I think that is great that we are all going to Heaven, but it seems to me that if we confess Jesus as Lord and believe God raised him from the dead, we are going to heaven no matter what sins we commit while we live. So what makes all the suffering worth it? Paul explains this to us today in our scripture reading! When he wrote to the congregation in Corinth, he was well acquainted to suffering for Jesus. He had been beaten, imprisoned, despised, stoned, kick out of cities. Paul was a case study in suffering because he was trying to live for Jesus. Paul’s answer to the question, “why should anyone suffer for the sake of Jesus, when he has already saved us?” Is because it produces an eternal weight of Glory! Paul says that this glory is heavy. In fact, even Paul’s extreme burdens seem light compared to how heavy the Glory is that Paul is achieving in eternity! So the heaviness we feel in our soul from suffering for Jesus, is worth it, because of another king of heaviness… that of Glory. Now, This answer did not make a lot of sense to me for many years. That is because I really had no idea what glory was. So I’m going to take some time to try to explain the reason why the Glory of God that we achieve by our temporary suffering in this life is so much better! First of all, Glory is heavy. When I say heavy here, I mean it is significant. It has weight and worth to it. It is heavy, like a wonderful moment we might experience in life. 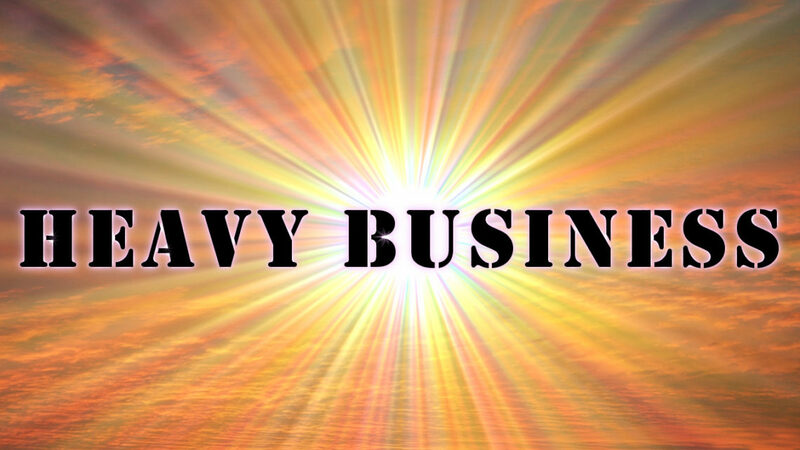 Have you ever had an experience that was “heavy?” I’m not talking about moving refrigerators and other big objects. I mean have you ever been in a situation where you saw something that took your breath away? A moment where you experienced something so special, so amazing, or so beautiful that you had no words to say? There are many times when we might have an experience that is “heavy.” It could be when you see your husband or wife for the first time at your wedding. When it is time for the bride to walk down the aisle. It could be when you graduate from high school or college. It could be when you are baptized, or when you meet with God in communion. It might be the first time you see your newborn child. Or when you see your child on a sonogram and it looks like a person. It could be when you first see a natural wonder like the Grand Canyon. It might even be that moment in a relationship when you realize that you are breaking up. “Heavy” moments are important moments. Heavy moments are full of meaning and significance. They fill us with emotion, and importance. They hit us hard right in the gut. What I am calling a “heavy” moment is when you or I experience a little taste of Glory. Glory is heavy. Second of all. Glory is bright. The bible tells us that the Glory of God is so bright, that it actually sticks to things that are around it. One famous example is Moses in Exodus 34. Moses saw the Glory of God’s back, and because of that, his face shined so brightly that it scared the Hebrews! It is like a sticky luminosity that shines with every color of the rainbow. It is cosmic awesomeness in visual form. God says that our resurrection bodies will have this kind of Glory. Paul tells the Corinthians all about it in 1 Corinthians 15, but also in our passage this morning, Paul reminds us that this new glory is eternal, where as anything we achieve in this life is only temporary. Glory is cosmic brightness and light, and the heaviness of importance. These are the things we achieve when we live for Jesus in our life. Our present sufferings seem heavy, but they are nothing compared to the Glory they produce for us. It is hard to understand glory, because it is such a heavenly concept. As I just explained, the Bible says glory is importance and significance and light. But even that description is hard to understand. C.S. Lewis has a great sermon about this, called “the weight of glory.” It is a both a sermon, and a book that he wrote that contains the sermon. And you can get it free online if you go to Wikipedia, our wise internet resource. I mention this sermon because C.S. Lewis explains that the significance of Glory that we achieve when we allow ourselves to suffer for Jesus, is acceptance and delight of God in us. In other words, God will accept us, but also delight in us, and what we have achieved in our lives! And that is how C.S Lewis explains the heaviness or “weight” of glory. That is perhaps the best explanation of glory that I have ever heard. And it is the only one that makes sense to me. Of course even the most intense suffering in life seems tiny compared to this glory! Because there is nothing better that having God accept us and delight in the things we chose to do while we were alive on this earth! It isn’t that God only loves and accepts people who suffer greatly for Jesus sake. God loves all those who accept Jesus Christ. We are all like sons and daughters to God, and God loves us like children. But God’s delight, well, that can be achieved to a greater degree if we suffer for Jesus name! The idea that Paul is giving us is that if the value of things is measured by how heavy they are, then Glory is the heaviest thing in the universe! There is nothing that can top God’s acceptance, approval, and delight for all eternity! It’s like an eternity of seeing the grand canyon for the first time. It is like an eternity of falling in love for the first time! It’s is actually even better than either of those, but our human brain can’t yet understand just how wonderfully heavy glory is. That is why if you put 80 or 90 years of living the best life possible in this world in one side of a balancing scale, and an eternity of God’s love, and delight in the other side of the scale, the scale doesn’t even tip. The love and delight outweighs a single great life by one million times! That’s how much more weighty eternal glory is when compared to a pleasant, fulfilling life. God’s glory is worth more infinitely more than the best life. That is why we can even endure the worst life if we have to. One word of warning here. God does not want anyone to suffer. That is not what God is about. God did not want Jesus to suffer either. It is because humanity chooses itself over others that suffering exists. And often, suffering happens when we try live for Jesus because we shine a light on the darkness and selfishness of this world. People don’t like to have their darkness exposed. But if you are trying to live your life for Jesus, and you are not experiencing a heavy burden of suffering, then that is great! That is a blessing! You don’t necessarily need to be a miserable martyr in order for you to be living for Jesus, and producing glory. But if you every get to that place where you are experiencing suffering because you want to live for Jesus, and make God happy. Then know that no matter how bad it gets, it is nothing compared to just how much Glory you are accumulating in eternity! Also know that you don’t have to wait until you die to experience the blessings of glory! When you spread the good news of Jesus in word and deed, you can be assured that God is delighting in you! And if you can accept that truth, your heart can be full of joy and worth, even in the midst of suffering. If anyone ever knew suffering for Jesus, it was the Apostle Paul. He suffered in many ways so that he could teach people about Jesus and make God happy. And he reminds all of us, that when we do what God wants us to do, even if we get suffering instead of reward in this life, it is worth it! It builds up glory that we get to participate in in Eternity! That glory gives us Joy and worth in this life, right now. The glory is heavy in a good way. It is God’s acceptance and delight. It is the shining cosmic glow, that is more awesome than we can imagine. It weighs more than any trouble we have in this life! So be encouraged to live boldly for Jesus. Even when you feel crushed under the load of this life and the sufferings in it. Don’t worry about the things of this life, except to use them to please God. Then you will be fixing your eyes on the unseen things as Paul says, the immeasurable weight of glory that we are achieving both now and forever!